Published on May 9, 2008	in government, policy, shine and shine2008. 1 Comment Tags: DCLG, policy, shine2008. 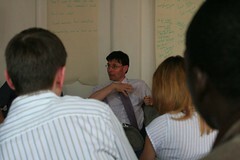 1) Help people internally understand what social enterprise is and get them enthused about the agenda. 3) Need for evidence base: absolutely key, particularly in these newer areas. “That’s where I’m at: interested to here what you think, and what you think about these issues”. - any specific areas of policy? - how to work with other departments? how to link them? Somebody from SEC asking a question about whether local and regional government have same level of knowledge or trust in social enterprise as central/national; how can DCLG help local authorities to get on board (does it have powers to ‘force’ or ‘compel’)? DR: Government is devolving a lot of power, and not about telling LAs what they should do / how they should operate. Primarily a role of influence (not command and control): to set the framework, to raise consciousness and move people on. There are leaders in the LA sector; + refers to Audit Commission star ratings as an incentive and a motivator. That’s an example at the ‘harder’ end of influencing. Empowerment white paper has a role there in influencing the debate, changing the tone. Question about scope of responsibilities…and cross-departmental role. Woman from childcare voucher system (which gives profits to children’s charity). Discussing how LAs don’t take them seriously enough + process is extraordinarily long, and is a waste of resources in relation to private companies. DR: Why aren’t you getting very far? Raj from Innovation Exchange discussing the different attitudes of commissioners in different areas: independent living more ‘restrained’ / held back, but excluded young people more relevant…..how can relationship be redesigned? Woman (talking a bit quietly away from me): similar story about lack of understanding / lack of knowledge, no awareness of range of possibilities. Need for creating opportunities to see and build trust. DR: LAs need to tender in accordance with European regulations….some things they are forced to do (European stuff can be very tedious). Point about raising consciousness very important: journey local authorities are going on. Took time previously (i.e. we don’t have to do this all ourselves) to get them to an understanding, and it will take time. DR: Gateway covers that [woman doesn't agree]. I’m a Gateway reviewer, so that is included in that process. More questions about investment / risk could be raised at this stage also. 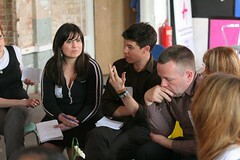 Woman from Wales setting up a community centre (UnLtd award winner)….need to give to individuals, not just structures. Another person raises very practical issues: office space, funding; idea of local authorities interacting with them to use buildings. Ceri from SEC: reference to economic growth strategy and worklessness agenda. Ceri backs RDAs to give seedcorn grants to social entrepreneurs. Cliff adds in re. venture commissioning….1/10 risk because you know one will work, but you know the benefits will be huge. DR mentions Adventure Capital Fund….this still not seedcorn, but getting things to scale. Point about different outcomes…and how these cut across different agendas. How can you encourage different elements (LSPs, LAAs etc)? 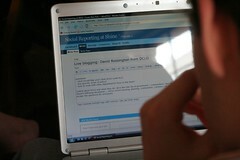 Should social enterprise networks be on LSP boards? DR: Also a good point [David has been doing a lot of writing down: how refreshing to have this kind of engagement with a government official]. Previously people were sceptical about this, but it is getting there….has been a lot of recognition that top down doesn’t work (for all), and that LSPs are key; wiring those in and creating a link is important. 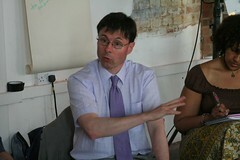 There are 150 local area agreements…..
[bloke from SEC again: I'd like more from the social entrepreneurs!] How do you get inside LAAs / LSPs etc? 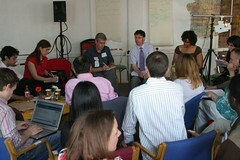 DR: Linked to specific set of outcomes; public partners come together to identify targets and then how to tackle them. How are LAAs held to account? Performance against them…+ central government monitor + various inspection agencies would judge whole partnership. Raj (again): Two points; how can I help in terms of building trust within commissioners (re. work at Innovation Exchange)….in order to better collaborate / work with each other (innovators / entrepreneurs); + how do we avoid LA taking over….difficulty of close relationships with local government. Commissioner: entrepreneur relationship needs to ensure social entrepreneur mission remains true. DR: 3 points. Raising consciousness + holding events (such as this! ); always ask the question “what benefit can you bring to the person you are trying to work with?” If you can answer that in a constructive way, that is a solution to the problem. [how can I get commissioners to want to engage?] Comes down to clarity about event and what it is trying to achieve + comes down to human relationships. Question about lack of trust…but that is related to lack of proof. Need for evidence in order to assure re. credibility etc. Is there something about creating an evidence base: badging it with DCLG to make research compelling for local commissioners? DR: Agree that this is an area we can help; research base that we publicise. David Dawes: Commissioner for 8 years, social entrepreneur for 5 years (poacher turned pheasant); will never be an excellent commissioner, and the need to diversify revenue streams, and get income from other sectors. At best, commissioning will move from crap to “not-too-crap”. CP: need to factor in risk of continuing status quo (as in, what we currently have is rubbish, so what’s the risk in trying something new?) In areas of community cohesion…..for example. Can the system assessing risk factor that in. [different bloke from SEC]: question about planning re. DEFRA + community-owned stuff (assets, wind farms etc.) and need to make links across government departments. Further point that secondments have to be useful and recognise and share the learning; need for proper planning. People with potential, not just the people who want to escape. Session is petering out slightly…asking for areas they can work in / address [I mention housing, someone else mentions user-designing of services, empowerment] Wales woman is back on the warpath: hugely passionate and inspiring….and responding to the challenge. CP making a point about resistance to individuals / leadership (re. communities / groups). OK, it’s now officially turned into the Welsh woman, Charlotte Galsworthy, and all just loving listening to her. [will link to her site later] The fire of the dragon, if you excuse the stereotype, is alive and well in Charlotte. CP: where is DCLG struggling to achieve? which areas? DR: that’s why we need to check out how it fits with department; come and see you as a specific solution to a problem….rather than the generic top-down approach (DoH). CP: replication also on the agenda about how to spread best innovations…. Further questions: can there be investment about demonstrating outcomes? can DCLG provide a lead on this? + difficulties of dealing with multiple outcomes: how can this be made accessible for social entrepreneur-led organisations? Also, further points about how outcomes / targets are generated: “local people know what local areas need”. DR: would back need for common language. [final thoughts and comments now]: need to fund over a longer period (two-year not enough); DR agrees, although sometimes difficult depending on restrictions. More discussion of outcomes….need to get the stat people in. More questions about evidence. DR: a lot of generic and general stuff: citizen survey on attitudes and perceptions etc. ; what we don’t have is looking beyond case studies / high-level statistics…looking at causes etc. Wrapping up now…DR says has come just at the right time. Thanks and applause. It’s great to have this report. 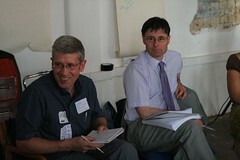 Also contributing to RCN Summer School (NI) on a ‘Leraning to Earn’ (social enterprise) ticket. Looking at the CLG organogram, I _think_ the secondment falls within DR’s remit – will check and follow-up.